Laparoscopy can be used for diagnosis, treatment, or both. A diagnostic procedure can turn into treatment. 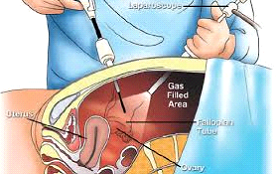 Laparoscopy is always performed under general anesthesia. This means you will be unconscious for the procedure. However, you may still be able to go home the same day. Once you are asleep, a small tube called a catheter will be inserted. This collects your urine. Then your abdomen will be filled with carbon dioxide gas. This is done with a small needle. The gas keeps the abdominal wall away from your organs. It reduces the risk of injury. The surgeon will make a small cut in your navel. The laparoscope will be inserted. It transmits images to a screen. This gives your doctor a clear view of your organs. What happens next depends on the type of procedure. For diagnosis, your doctor might take a look and then be done. If you need surgery, other incisions will be made. Instruments will be inserted through these holes. 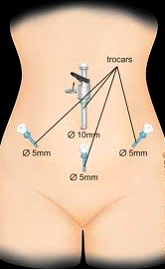 Then surgery is performed using the laparoscope as a guide. Once the procedure is over, all instruments are removed. Incisions are closed with stitches. Then you will be bandaged and sent to recovery. Preparation depends on the type of surgery. You may need imaging tests. Your doctor might order fasting or an enema. Tell your doctor about any medication you take. This includes over-the-counter drugs and supplements. You may need to stop them before the procedure. Plan to have someone drive you home after surgery. You will not be allowed to drive yourself. Once the procedure is over, nurses will monitor your vital signs. You will stay in recovery until the effects of anesthesia fade. You will not be released until you can urinate on your own. Difficulty urinating is a possible side effect of catheter use. Recovery time varies. It depends on what procedure was performed. You may be free to go home a few hours after surgery. You might also have to stay in the hospital for one or more nights. After surgery, your belly button might be tender. There may be bruises on your stomach. The gas inside you can make your chest, middle, and shoulders ache. There is a chance that you will feel nauseated for the rest of the day. Before you go home, your doctor will give you instructions regarding medication and side effects. Your doctor may prescribe pain medication. You may also receive antibiotics to prevent infection. Depending on the surgery, you may be told to rest for a few days or weeks. Skin irritation and bladder infection are common side effects of this procedure. The gas used to fill the abdominal cavity can also cause complications, if it enters a blood vessel. Pay close attention during the recovery period. Write down any complications and discuss them with your doctor.